The doors in the Florence airport fling open as my big toe hits the mat in front of them. I’m momentarily dazed at their flagrant efficiency, and then chide myself for this typical North American attitude. Yes, they have sliding doors in Italy, too. Standing on the hot pavement outside, I spy a sign displaying the temperature as 32 degrees, although it is 6:30 in the evening. I watch a bleached blonde girl join the taxi queue while smoking a cigarette and drinking a bottle of beer. Although the smell of cigarette is affronting, it is at the same time a refreshing sign that I have indeed changed continents. My husband and children pick me up and we proceed to get lost for the next three hours in the Tuscan countryside as we look for the villa they have inhabited for the last three days. We navigate narrow roads void of center lines that look like one-way lanes, but yet lorries and boxy Italian cars fly past us going the other way. We circle round abouts again and again looking for the names of villages we recognize, and finally just guess on a direction after seeing none that are familiar. Finally, dusty and hungry, we arrive at our villa, named La Torre, not far from the village of Panzano. It is 900 years old, and nestled amongst vineyards and olive trees, postcard perfect. It is split up into 5 apartments, and there are two other families staying on the property; one from Chicago and one from Germany. The Chicago family leaves early to explore different things each day and return late at night. The German family rarely leaves the property. We are somewhere in between, taking small, short daytrips, but spending lots of time lounging by the pool. The German’s have an eleven-year old boy named Paul, who in desperation for a playmate turns to our three girls. He speaks no English, but after a day or so they are speaking the language of play; which here means various forms of ball, pool games, and cricket hunting in the vineyards. Their voices echo all over the property, bouncing off the medieval walls of the tower, as they call each others names. It is curiously true that everything tastes better in Italy. The tomatoes are sweeter, the basil more lively, the parmesan more pungent. I was prepared for this. What is surprising to me is the aromas that you encounter. Rosemary bushes are everywhere, their intense sweetness can be smelled long after they are out of sight. Lavendar plants send floral cues floating about the nearby atmosphere. Lounging under the shade of an olive tree the smell of sage is overwhelming. Taking our clothes down from the clothesline, the fresh mint in the field overwhelms the scent of fresh laundry. Walking through the vineyards is to experience all of these scents mixed together, like living in an overgrown herb garden. A sensory pleasure, especially of the nasal sort. I’m so glad to know you have been able to get to Europe! And thank God you are settling into a nasally nurturing environment. Smell is the most primitive of the senses, and I would expect the one most easily associated with healing and comfort. Blessings to you and your family as you rest and recover! Thanks so much Kathy – for all of your lovely comments along the way. So glad you arrived in Italy Deanna…long trip, however by the sounds of things it won’t take you long to settle in to “vacation” mode. Enjoy your holiday, and see you again soon. 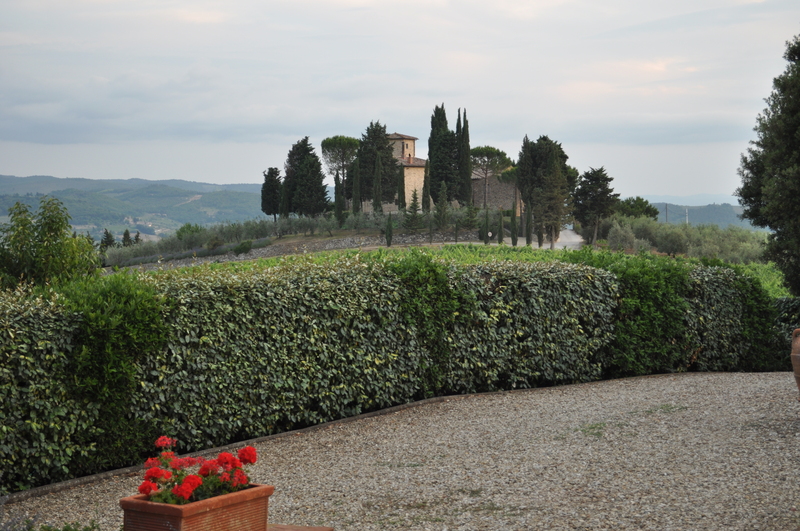 We have been talking about how much you guys would like it here… the chianti flows like water. Lovely! Hope you guys have the trip of a lifetime! Well deserved that you are enjoying the beauty that surrounds you. I look forward to following the adventures. Hugs. I’m going to go take a whiff of the tiny rosemary bush on my back patio and live this vicariously through you. Love love love. So happy you are there! Have been anxiously awaiting your descriptive posts about Italy and France. Enjoy!